Dr. Kayla Corriveau visits with Jasmine in the Auburn University College of Veterinary Medicine’s Physical Rehabilitation Service. 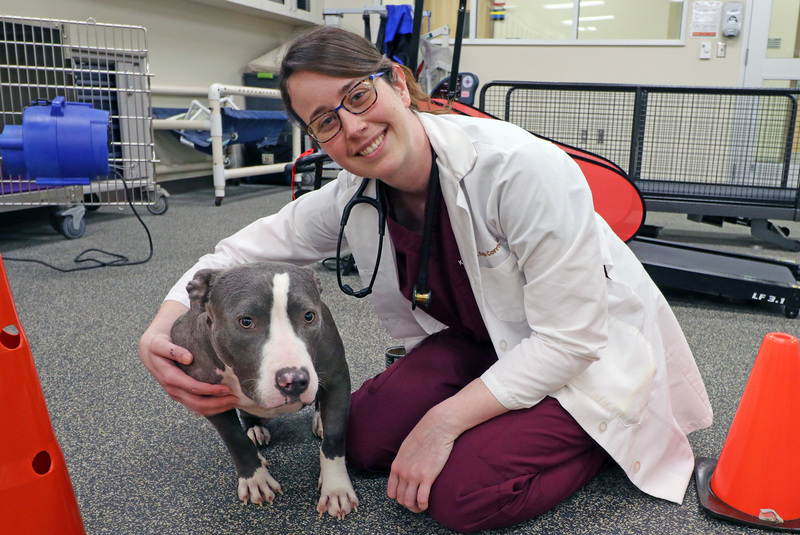 Dr. Corriveau performed the surgical procedures that gave Jasmine a new lease on life after the dog was found abandoned and injured on a Georgia roadside. Severely injured dogs who are abandoned and left to fend for themselves have little chance of survival, much less a chance to enjoy a positive quality of life. But Jasmine has been given a new lease on life, thanks to her rescuers and treatment and care received at the Auburn University College of Veterinary Medicine. Jasmine, a 4-year-old pit bull mixed breed, was found roaming the street by Courtney’s Canine Care Rescuers Inc. in Hampton, Georgia. Fleming was able to take custody of the dog and ultimately get her to Auburn for veterinary care. The dog was under nourished and upon examination, was found to have sustained severe injuries in both back legs. “Radiographs showed that she had a multi-break femoral fracture in the right hind leg and a coxofemoral luxation [hip dislocation] in the left,” Dr. Corriveau said. 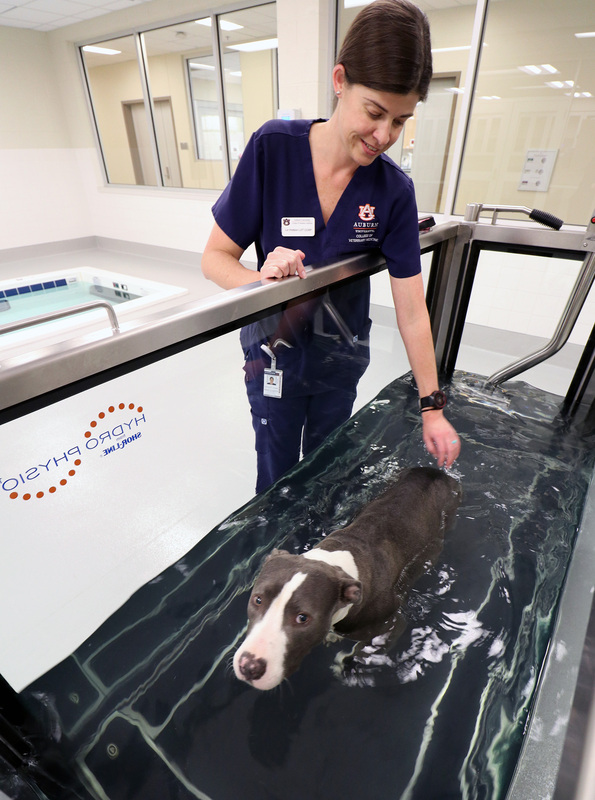 Liz Hodson, a Certified Canine Rehabilitation Practitioner and licensed veterinary technician, who leads the Physical Rehabilitation Service at the Wilford and Kate Bailey Small Animal Teaching Hospital, exercises Jasmine in the hydro treadmill. Dr. Corriveau and her team performed a four-hour surgery to repair the right leg in late February, and another hour-long surgery to repair the left leg in early March. “The procedures involved placing a plate and rod in the right hind leg and removing the ball of the hip joint in the left,” Dr. Corriveau said. Both surgeries were successful, and Jasmine currently is recovering, having undergone physical rehabilitation at the teaching hospital. She was discharged to the rescue group March 22 and sent home with instructions for a continued exercise program comprised of a regimen of weight-shifting exercises and walking. Her veterinary medicine treatment team is comprised of the specialty service units of radiology, orthopedics and physical rehabilitation. “It is wonderful that [Jasmine’s] rescuers and their sponsors are willing to do this,” Dr. Corriveau said. Fleming said anyone interested in learning more about the dog adoption program and possibly adopting Jasmine can contact Courtney’s Canine Care Rescuers Inc. at 678-988-8440. The case is an example of Auburn faculty delivering life-changing care and treatment while providing students an extraordinary, hands-on educational experience.